Written by Catherine Saxelby on Friday, 16 October 2009. BARLEYmax. It's being touted as the greatest super food of all time and the king of cereal grains. BARLEYmax has finally appeared in our food supply in the form of three new breakfast cereals, the first products to be made with the super barley. It's been over 12 years in the making with scientists from CSIRO devoting their life work to breeding it, testing it, growing it as a commercial harvest, and finally working with a food company to create interesting new products that showcase its benefits. So it was with a great degree of interest that I sampled the first two of three new cereals from a small manufacturer Goodness Super Foods. Claim: "Super wholegrains for balance, shape and energy release"
On sniffing the cereal in the pack, the first thing I noticed was a rich malty aroma which was very pleasant and inviting. So far, so good. The cereal consisted of dark golden-brown flakes of barley (looking similar to oats in appearance) with lighter tiny flakes of soy scattered in between. It seemed to me to be a little too well-browned, like a toasted muesli that's sat in the oven a little too long. The list of ingredients told me that the main ingredient was BARLEYmax at 68%, then some golden syrup, soy flakes, amaranth 5% and finally 5% of honey. I guess that nice aroma I first detected came from the golden syrup and honey both of which would have contributed to the dark colour, darker than most other cereals. When I finally ate it, the taste was somewhat disappointing. I must admit I found it tasted a little dry, somewhat burnt in taste. It definitely needed a lift from a sliced banana or a couple of spoons of yoghurt or stewed apple to make it more interesting and palatable. 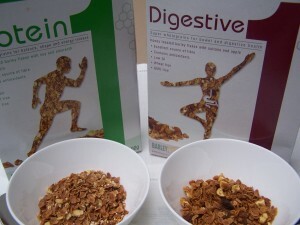 Claim: "Super whole grains for digestive and bowel health"
First impression not wonderful! This cereal had the same dark-brown colour as Protein 1st but with bits of dried apple and sultanas obvious among the flakes of barley. However it had less flavour than Protein 1st and tasted a little chaffy. The label said it contained 67% BARLEYmax mixed with sultanas, apples and honey. Half a cup (45g) of Digestive 1st gives you 11g of fibre, which represents about one-third of your recommended fibre intake for the day of 30g. The third cereal appeared in supermarkets early in 2011. We taste-tested in March 2011 and found it dry, tough to chew, quite dark in colour with a slightly bitter-burnt flavour. It didn't taste sweet at all and was hard going to eat. We wouldn't buy it again - sorry. The barley cereals knock the socks off Morning Sun natural muesli or the more popular Just Right (Kellogg) for fibre. For around the same kilojoules (calories), Digestive 1st and Protein 1st had triple the fibre, double the protein and one-third less carbohydrate which was a surprise. At 6 to 9% fat, the fat was way higher than Just Right which has a low 1.5% but on a par with muesli at 7% where the fat is derived from oats (naturally rich in fat) as well as added nuts and seeds. Both cereals are low in sodium although Digestive 1st has over twice the sodium of Protein 1st for some strange reason that I can't fathom. There aren't any sodium-based ingredients or additives on the Ingredient list. Digestive 1st contains a preservative sulphur dioxide (220) to maintain the quality of the sultanas and dried apple it has but this may not be something that health-conscious consumers would like to see there. All four cereals used the same serve size which was half a cup or 45g. All had very similar kilojoule counts - around 680kJ or 162 calories in a bowl. See my summary of the nutrition figures. Above: BarleyMax growing at Moree in northern NSW. OK but a tad heavy-going. All cereals look and taste ‘heavier' that the common fruit-flake cereals such as Just Right or Sustain yet are not as chewy nor as hard-going as some toasted mueslis. Would be nicer with one-quarter natural muesli, oats or another cereal mixed through. BarleyMax comes up as the perfect cereal with all the right boxes ticked. Its big advantage is that it gives me barley in more accessible form than pearl barley (think soups) so I can eat a different grain to wheat and oats. And it boosts the fibre and resistant starch of your breakfast like no other. Unlike other supermarket cereals, it isn't fortified with the usual four B vitamins (thiamin, riboflavin, niacin and folate) and iron. There's no information on the B content of the cereals on pack. Digestive 1st has a low GI of only 39 while Protein 1st is 36. This is lower than a standard muesli at around 50 or Just Right at 60, according to the Low GI Shopper's Guide to GI Values. Nothing to cook. Just pour into a bowl and eat. BarleyPlus porridge, muesli and bars are available exclusively through Coles in their health food aisle. Barley+ is a brand by Freedom Foods utilising barleyMax as an ingredient. Read about oats as one of my super foods - similar nutritionally to regular barley. Discover how CSIRO devloped this super grain - read the Barleymax story and watch their scientist and producer discuss it. Find out more about BarleyPlus and the science behind this range of foods.